Posted on 3, December 2018 by EuropaWire PR Editors | This entry was posted in Germany, Industrial, Internet & Online, Italy, Netherlands, Sweden, Technology and tagged 2G, 3G, Bluetooth, Cologne, Holger Kunz, IoT, IoT services, Leek, LoRa, Lund, Milan, Nuremberg, SIGFOX, Stefan Kischka, Sven Eric Weber, testing, TÜV, TÜV Rheinland, WiFi, Wireless, wireless laboratory, wireless network, ZigBee. Bookmark the permalink. NUREMBERG, 03-Dec-2018 — /EuropaWire/ — At the end of November, the globally active testing service provider TÜV Rheinland heralded the opening of its new wireless laboratory in Nuremberg with a customer event. With this event, TÜV Rheinland is further expanding its global commitment in the field of wireless technologies and expanding its European wireless network. In addition to Nuremberg, TÜV Rheinland is also represented with corresponding IoT laboratories in Lund (Sweden), Leek (Netherlands), Cologne (Germany) and Milan (Italy). “The laboratory in Nuremberg enables us to offer the latest IoT services on site. Our customers will find the entire spectrum of wireless test options for state-of-the-art technologies such as SIGFOX, LoRa, 2G, 3G, Wi-Fi, Bluetooth and ZigBee,” explains Stefan Kischka, Vice President Wireless/ Internet of Things at TÜV Rheinland, who accompanied the official laboratory commissioning together with Holger Kunz, Executive Vice President Product at TÜV Rheinland, and TÜV Rheinland experts Sven Eric Weber and Sajid Mohammed. “We succeeded in opening the new wireless laboratory after only 18 months of planning and construction. In total, we invested around three million euros on site in the laboratory technology alone,” says Laboratory Manager Sven Eric Weber. The new wireless laboratory in Nuremberg will in future be an important part of the existing TÜV Rheinland laboratory centre on site. “On a total area of around 300 square metres, distributed over the new wireless laboratory, which consists of four test cabins and a new absorber chamber, as well as three test halls, we cover the wireless requirements of all sectors comprehensively,” explains Weber. 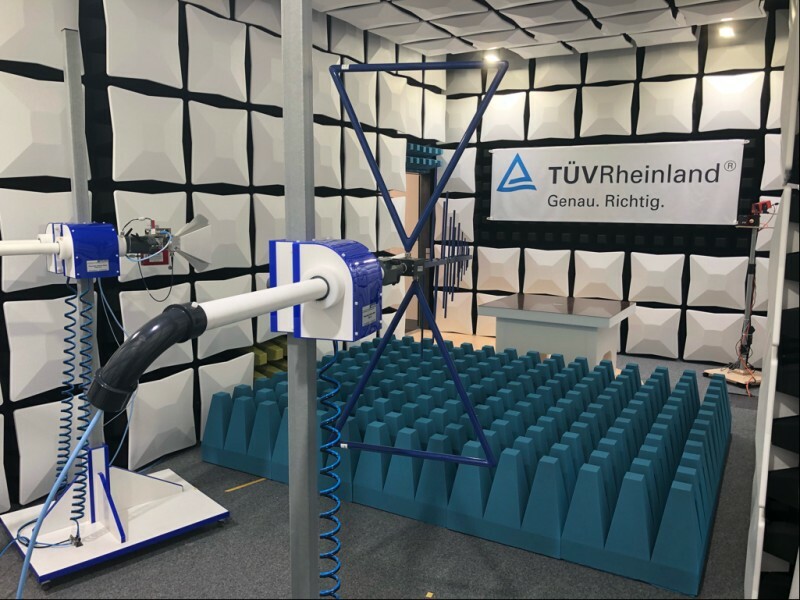 In addition to the TÜV Rheinland laboratory in Lund, Sweden, Nuremberg is the second European wireless laboratory to offer tests for both short range and long range technologies. For February 2019 an additional equipment of the laboratory with measurement technology (RADAR, WIG60 etc.) up to 330 GHz is planned. “This will enable us to offer a broad scope in the field of radar systems, especially in the automotive environment,” Weber continued. The new opening in Nuremberg is part of a broad expansion of the worldwide wireless network of the testing service provider. It was not until spring 2017 that the company opened its laboratory in Fremont, California. This was followed shortly afterwards by the acquisition of the wireless laboratory in Lund, Sweden. In October of this year, the IoT Excellence Center was opened in Shenzhen, China. “The laboratory in Nuremberg is a further milestone that excellently complements our offering and brings us another step forward in fulfilling our TÜV Rheinland Wireless Strategy 2020. We will continue to push ahead with the expansion of our testing capacities in the future,” says Stefan Kischka.